Neighbours : On Halloween we had some small neighbours come knocking, dressed as witches. 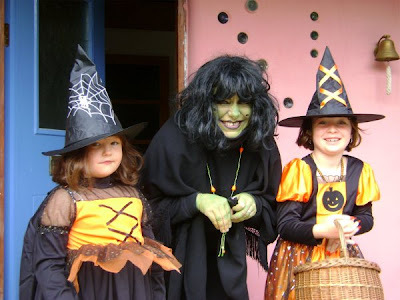 We hadn’t quite understood “Trick or Treat”, so Gabrielle’s idea was to dress us as a bigger and scarier witch and give the children "Tricks and Treats", i.e., scare them, then give them sweets! Camille seemed to warm to the idea but poor old Tess (on the left) was left very bemused, grappling for Camille’s hand for reassurance. Our immediate neighbours have done us proud today. I’m being slightly disingenuous as I’m referring to the current holidaymakers staying in our gite. Soon after arriving and looking around our permaculture smallholding, Carolyn and Kent offered to help. With a break in the clouds and a hint of blue sky today suggesting a break in the weather, we spent the day working together in our woodland. They were a real help and even professed to having really enjoyed it. As we emerged from the wood at lunchtime, I was hailed by David (French, so read it as “Dahveed”) who lives in an old presbytery at the entrance to the wood. Some time back he’d come round to our house to ask for my help navigating some Anglophone pages on the Internet and making a few phone calls in English to sort out a technical problem on a depth sounder on his sailboat. He insisted on buying me a bottle of wine to say thanks and very kindly presented me with a 2000 bottle of Cotes de Bourg today. Cheers, chum! And that’s not the first bottle of wine I’ve been given this week. Marie Laure’s parakeet escaped last week as she opened the cage to feed it. 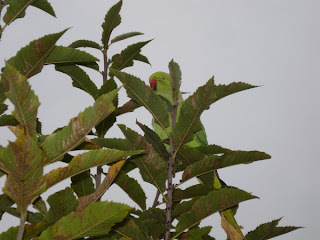 The shape of a parakeet in flight and its call are very distinctive, oh, and it’s bright green too, certainly not your average wild French bird. It stayed around the area until, after three days, it dropped down into our willow bed. (The photo shows it in the new rods of a coppiced sweet chestnut.) I ran round to M-L’s to get its feeding tray and a cupful of grain and Gabrielle went for the fish landing net. Katerine from the local chicken farm turned up with her two boys, Eduard and Paul, out together for a cycle ride. The five of us spent a good hour trying to coo the recalcitrant bird down, including an interlude when I knocked the grain out of my hand when swatting the net and had to run down the road to get some more. At the fifth attempt, I had the beast in the back of the net and returned him home. One bottle of 2003 Margaux from a grateful Marie Laure. 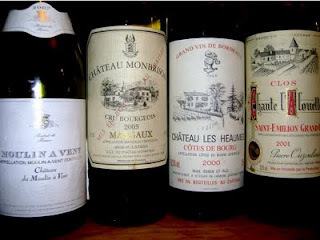 Christiane was next with a 2001 bottle of St Emilion to thank me for my help in dealing with any English people who book there own 6-person gite and to celebrate their first such booking of 2010. And when I turned up at 10am last Saturday to translate at the checking out of their English guests, it was the holidaymakers themselves who had a bottle each of Moulin-à-Vent for both Paul and me as they’d had such a good stay. Perhaps there’s a worrying trend with the choice of cadeaux, they must think me a right old souse. 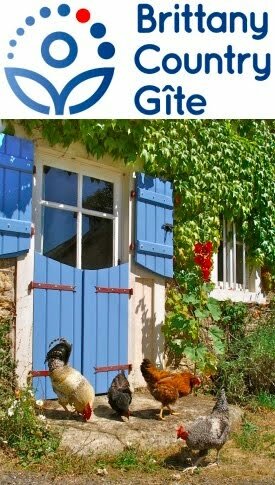 Postscript: if you fancy booking a holiday in our gite, please note that volunteering to help out isn’t obligatory! However, if you do fancy volunteering over the winter in exchange for cosy accommodation and meals, please have a look at our volunteer page. And if I do you a favour, I won’t be expecting a bottle of wine in return … but it’s always very much appreciated !